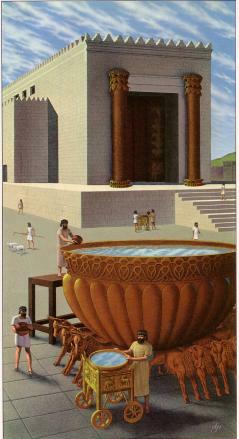 King Solomon supervises the construction of his temple. Seven years for the temple. But 13 years for his own place. 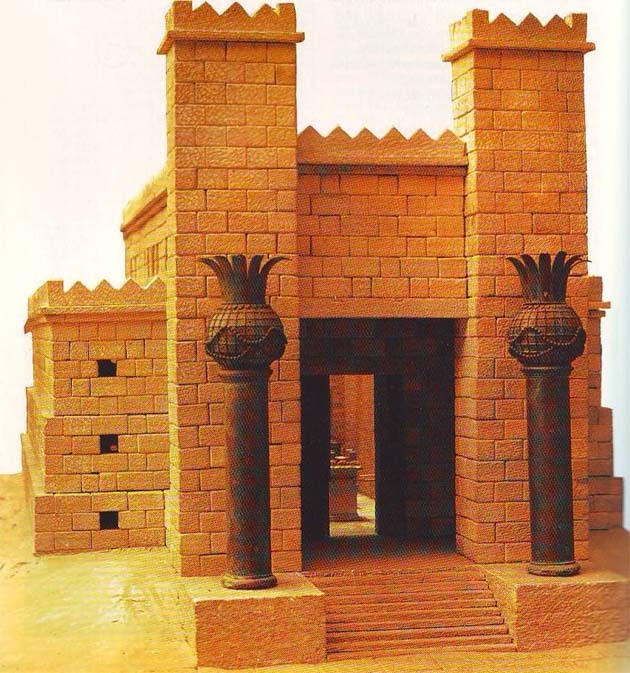 2 He built the Palace of the Forest of Lebanon a hundred cubits long, fifty wide and thirty high (that is, about 150 feet long, 75 feet wide and 45 feet high), with four rows of cedar columns supporting trimmed cedar beams. 3 It was roofed with cedar above the beams that rested on the columns—forty-five beams, fifteen to a row. 4 Its windows were placed high in sets of three, facing each other. 5 All the doorways had rectangular frames; they were in the front part in sets of three, facing each other. 6 He made a colonnade fifty cubits long and thirty wide (that is, about 75 feet long and 45 feet wide). In front of it was a portico, and in front of that were pillars and an overhanging roof. 9 All these structures, from the outside to the great courtyard and from foundation to eaves, were made of blocks of high-grade stone cut to size and smoothed on their inner and outer faces. 10 The foundations were laid with large stones of good quality, some measuring ten cubits (about 15 feet) and some eight (about 12 feet). 11 Above were high-grade stones, cut to size, and cedar beams. 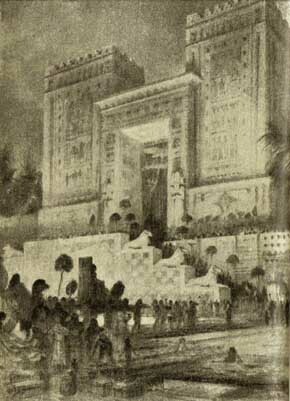 12 The great courtyard was surrounded by a wall of three courses of dressed stone and one course of trimmed cedar beams, as was the inner courtyard of the temple of the LORD with its portico. 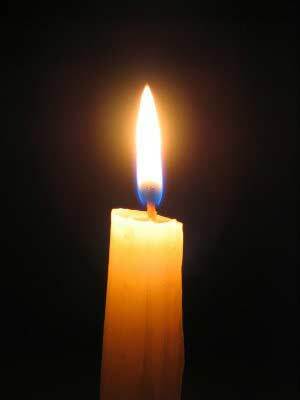 13 King Solomon sent to Tyre and brought Huram, 14 whose mother was a widow from the tribe of Naphtali and whose father was from Tyre and a skilled craftsman in bronze. Huram was filled with wisdom, with understanding and with knowledge to do all kinds of bronze work. He came to King Solomon and did all the work assigned to him. two bronze pillars . 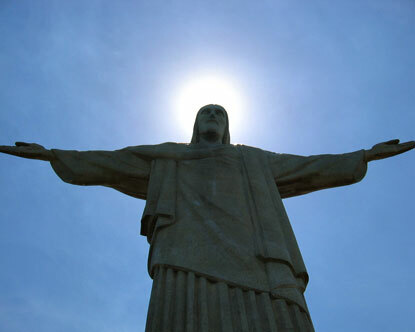 . .
15 He cast two bronze pillars, each eighteen cubits high and twelve cubits in circumference (that is, about 27 feet high and 18 feet in circumference). 16 He also made two capitals of cast bronze to set on the tops of the pillars; each capital was five cubits (that is, about 7 1/2 feet) high. 17 A network of interwoven chains adorned the capitals on top of the pillars, seven for each capital. 18 He made pomegranates in two rows encircling each network to decorate the capitals on top of the pillars. He did the same for each capital. 19 The capitals on top of the pillars in the portico were in the shape of lilies, four cubits (that is, about 6 feet) high. 20 On the capitals of both pillars, above the bowl-shaped part next to the network, were the two hundred pomegranates in rows all around. 21 He erected the pillars at the portico of the temple. 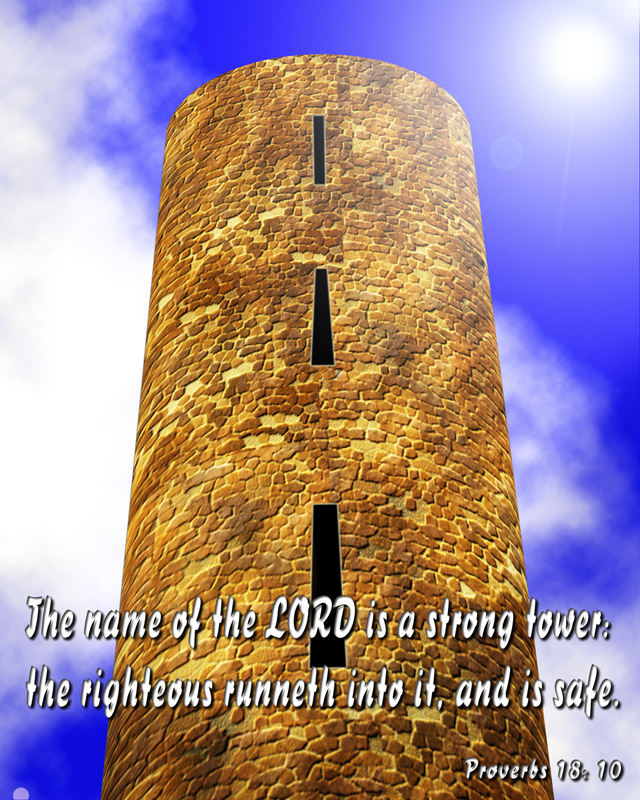 The pillar to the south he named Jakin (Jakin probably means he establishes) and the one to the north Boaz (Boaz probably means in him is strength). 22 The capitals on top were in the shape of lilies. And so the work on the pillars was completed. the Sea and a movable stand . . .
23 He made the Sea of cast metal, circular in shape, measuring ten cubits from rim to rim and five cubits high. It took a line of thirty cubits (that is, about 45 feet)to measure around it. 24 Below the rim, gourds encircled it—ten to a cubit. The gourds were cast in two rows in one piece with the Sea. 25 The Sea stood on twelve bulls, three facing north, three facing west, three facing south and three facing east. The Sea rested on top of them, and their hindquarters were toward the center. 26 It was a handbreadth (that is, about 3 inches) in thickness, and its rim was like the rim of a cup, like a lily blossom. It held two thousand baths (that is, about 12,000 gallons). 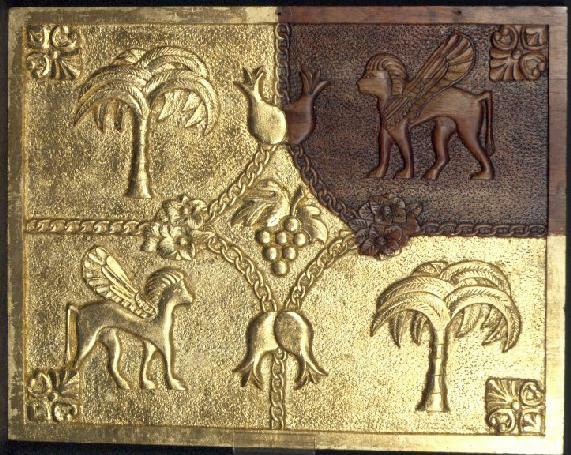 27 He also made ten movable stands of bronze; each was four cubits long, four wide and three high (that is, about 6 feet long and wide and about 4 1/2 feet high). 28 This is how the stands were made: They had side panels attached to uprights. 29 On the panels between the uprights were lions, bulls and cherubim—and on the uprights as well. Above and below the lions and bulls were wreaths of hammered work. 30 Each stand had four bronze wheels with bronze axles, and each had a basin resting on four supports, cast with wreaths on each side. 31 On the inside of the stand there was an opening that had a circular frame one cubit deep (that is, about 18 inches). This opening was round, and with its basework it measured a cubit and a half (that is, about 2 1/4 feet). Around its opening there was engraving. The panels of the stands were square, not round. 32 The four wheels were under the panels, and the axles of the wheels were attached to the stand. The diameter of each wheel was a cubit and a half. 33 The wheels were made like chariot wheels; the axles, rims, spokes and hubs were all of cast metal. 34 Each stand had four handles, one on each corner, projecting from the stand. 35 At the top of the stand there was a circular band half a cubit (about 9 inches) deep. The supports and panels were attached to the top of the stand. 36 He engraved cherubim, lions and palm trees on the surfaces of the supports and on the panels, in every available space, with wreaths all around. 37 This is the way he made the ten stands. 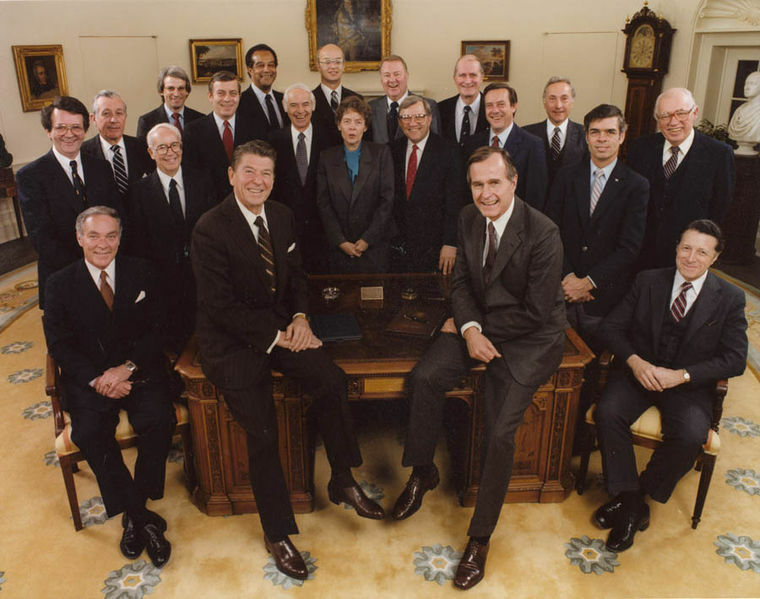 They were all cast in the same molds and were identical in size and shape. 38 He then made ten bronze basins, each holding forty baths (that is, about 240 gallons) and measuring four cubits across, one basin to go on each of the ten stands. 39 He placed five of the stands on the south side of the temple and five on the north. He placed the Sea on the south side, at the southeast corner of the temple. 40 He also made the pots and shovels and sprinkling bowls. 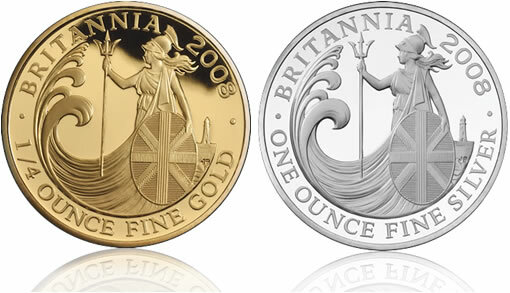 The king made silver and gold as plentiful in Jerusalem as stone. And valuable cedar timber was as common as the sycamore-fig trees that grow in the foothills of Judah. The text of “How lovely is your dwelling place” comes from Psalm 84. Of course, no one exactly what the Temple looked like. Here is one idea. Israelite time line, in round figures: 40 years wandering in the wilderness, 400 years under the judges, 40 years of ruling for each of the kings of the United Kingdom (Saul, David, and Solomon). 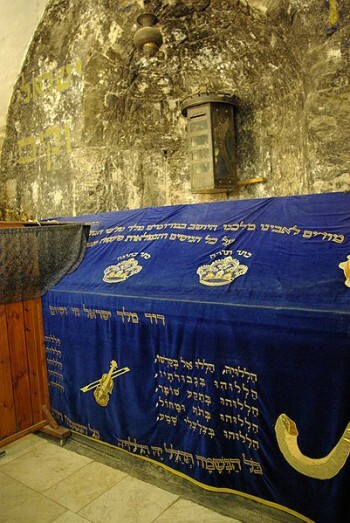 in the month of Ziv, the second month, he began to build the temple of the LORD. 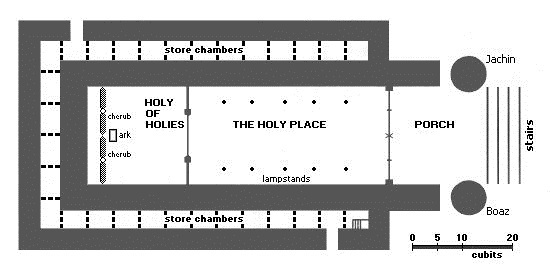 Then David gave Solomon the plans for the Temple and its surroundings, including the entry room, the storerooms, the upstairs rooms, the inner rooms, and the inner sanctuary—which was the place of atonement. David also gave Solomon all the plans he had in mind for the courtyards of the Lord’s Temple, the outside rooms, the treasuries, and the rooms for the gifts dedicated to the Lord. 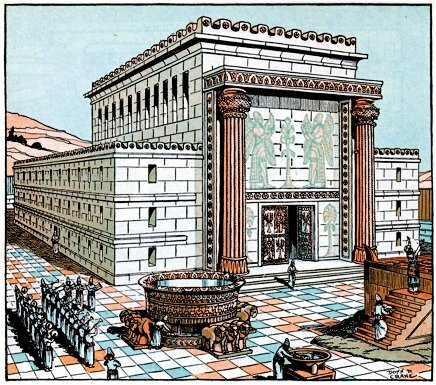 2 The temple that King Solomon built for the LORD was sixty cubits long, twenty wide and thirty high (a cubit is considered to be about 18- 20 inches, so the temple was about 90 feet long, 30 feet wide, and 45 feet high). 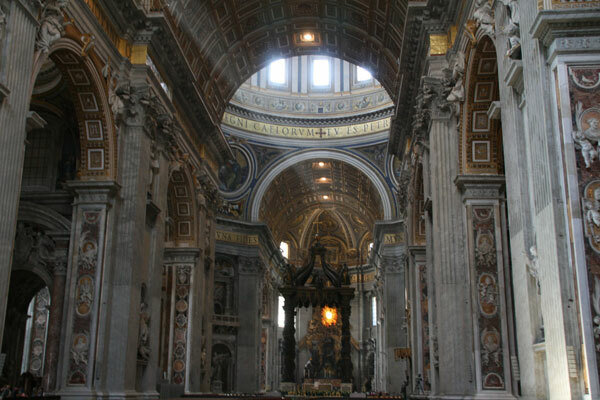 For purposes of comparison: Many of my readers may have been in St. Peter’s Basilica in Rome. That “temple” is 694 feet long, 451 feet wide (at transepts), and 151 feet high. 3 The portico at the front of the main hall of the temple extended the width of the temple, that is twenty cubits (that is, about 30 feet), and projected ten cubits (that is about 15 feet) from the front of the temple. 4 He made narrow windows high up in the temple walls. 5 Against the walls of the main hall and inner sanctuary he built a structure around the building, in which there were side rooms. 6 The lowest floor was five cubits (that is, seven and a half feet) wide, the middle floor six cubits (that is, nine feet) and the third floor seven (that is, 11 feet). He made offset ledges around the outside of the temple so that nothing would be inserted into the temple walls. 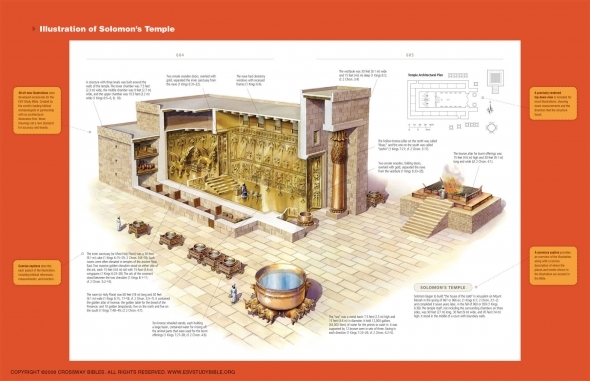 The Temple is very similar in layout and design to the Tabernacle, but twice as large. 14 So Solomon built the temple and completed it. 15 He lined its interior walls with cedar boards, paneling them from the floor of the temple to the ceiling, and covered the floor of the temple with planks of juniper. 16 He partitioned off twenty cubits at the rear of the temple with cedar boards from floor to ceiling to form within the temple an inner sanctuary, the Most Holy Place. 17 The main hall in front of this room was forty cubits (that is, about 60 feet) long. 18 The inside of the temple was cedar, carved with gourds and open flowers. Everything was cedar; no stone was to be seen. Gold everywhere! It covered the walls, the floor, the carvings . . . These cherubim in the Most Holy Place were about 15 feet high with wings that stretched 15 feet from tip to tip! They were magnificent, other-worldly creatures, representing the greatness of God! 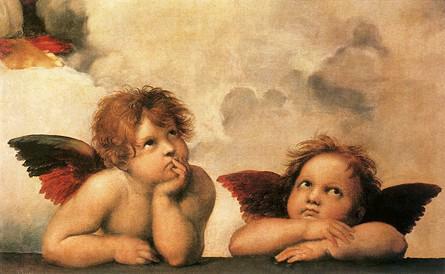 Hardly the innocuous, pudgy little “cherubs” so commonly seen today. One idea for the interior of the temple, looking up into the Most Holy Place. The curtain would usually have been closed. The temple that Solomon built and the Church are two very different things. The temple was a physical structure, but the Church is the Body of Christ, many believers united in our Head, Jesus. The following presentation of “The Church’s One Foundation” does a lot to show what we mean when we say that WE are the Church. Brian Moss sings. 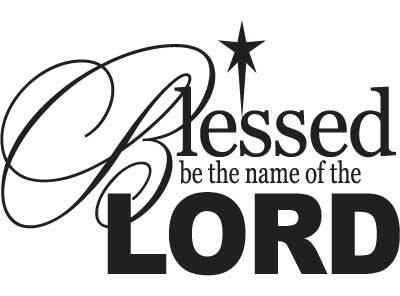 “Blessed be the name of the Lord” by Matt Redman. 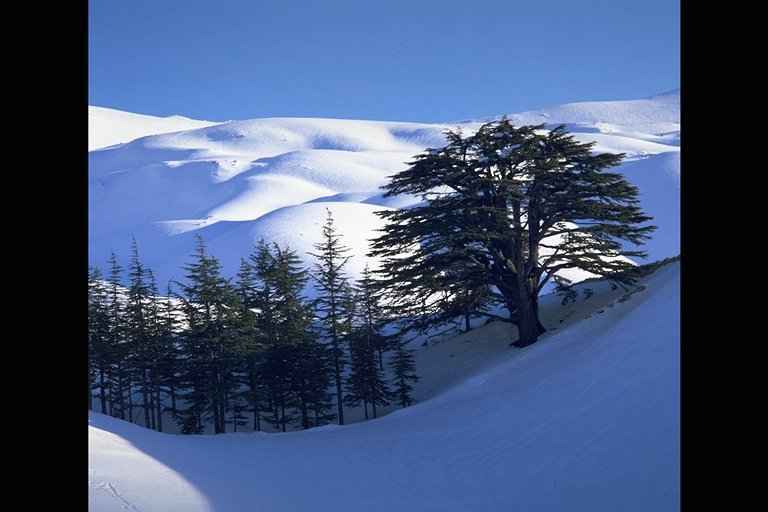 Throughout antiquity, the cedars of Lebanon were prized above all other trees. Their fine wood was strong, straight, and wonderfully scented. It was the first choice for any temple or palace, and top value in trade was paid for it. 10 In this way Hiram kept Solomon supplied with all the cedar and juniper logs he wanted, 11 and Solomon gave Hiram twenty thousand cors (that is, 3,600 tons) of wheat as food for his household, in addition to twenty thousand baths (that is, 120,000 gallons) of pressed olive oil. Solomon continued to do this for Hiram year after year. 12 The LORD gave Solomon wisdom, just as he had promised him. 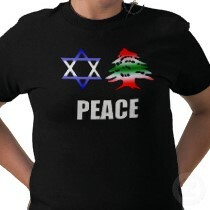 There were peaceful relations between Hiram and Solomon, and the two of them made a treaty. 13 King Solomon conscripted laborers from all Israel—thirty thousand men. 14 He sent them off to Lebanon in shifts of ten thousand a month, so that they spent one month in Lebanon and two months at home. Adoniram was in charge of the forced labor. 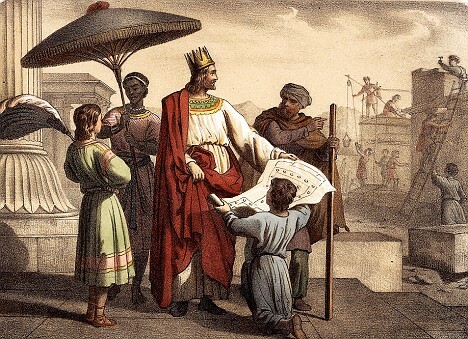 15 Solomon had seventy thousand carriers and eighty thousand stonecutters in the hills, 16 as well as thirty-three hundred foremen who supervised the project and directed the workers. 17 At the king’s command they removed from the quarry large blocks of high-grade stone to provide a foundation of dressed stone for the temple. 18 The craftsmen of Solomon and Hiram and workers from Byblos cut and prepared the timber and stone for the building of the temple. 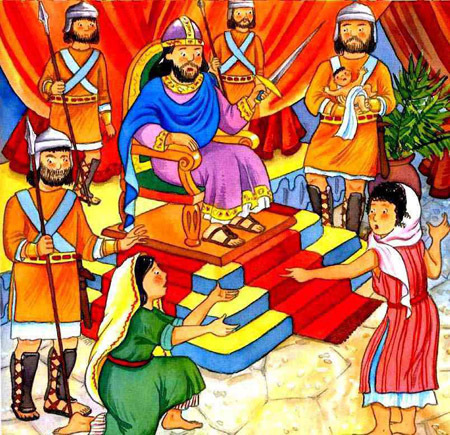 1 Solomon made an alliance with Pharaoh king of Egypt and married his daughter. This political alliance will lead to Solomon’s spiritual downfall. Now King Solomon loved many foreign women. Besides Pharaoh’s daughter, he married women from Moab, Ammon, Edom, Sidon, and from among the Hittites. 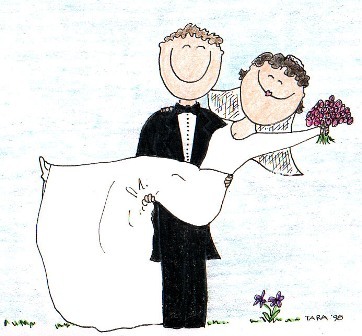 The Lord had clearly instructed the people of Israel, ‘You must not marry them, because they will turn your hearts to their gods.’ Yet Solomon insisted on loving them anyway. He had 700 wives of royal birth and 300 concubines. 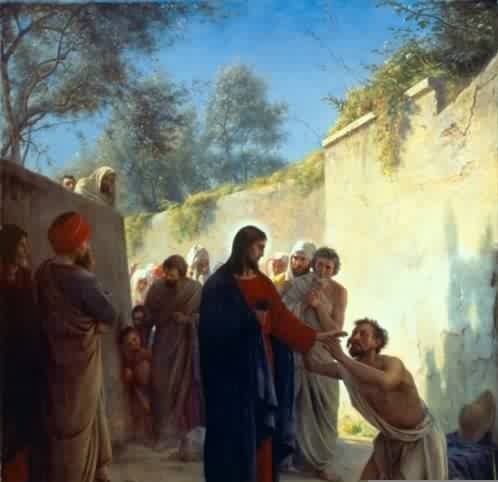 And in fact, they did turn his heart away from the Lord. 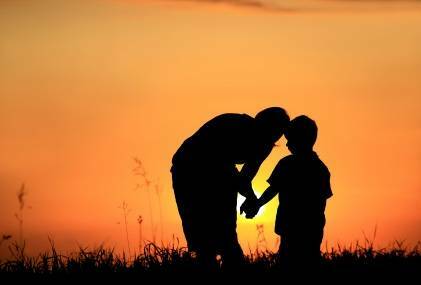 In Solomon’s old age, they turned his heart to worship other gods instead of being completely faithful to the Lord his God, as his father, David, had been. He brought her to the City of David until he finished building his palace and the temple of the LORD, and the wall around Jerusalem. 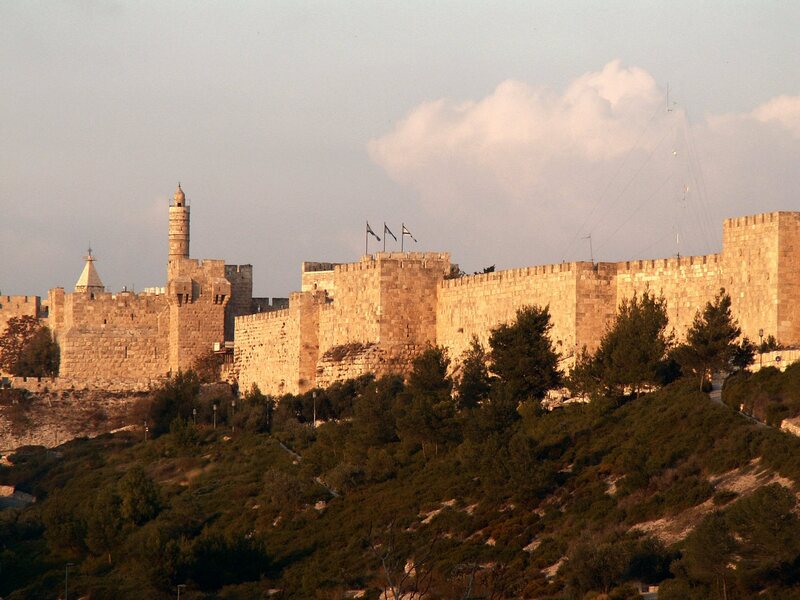 The walls you can see today around Jerusalem’s Old City were built by the Ottoman Sultan Suleiman the Magnificent during the years 1536-1541. The length of the wall is around 2.8 miles and it encloses an area of about a third of a square mile. 2 The people, however, were still sacrificing at the high places, because a temple had not yet been built for the Name of the LORD. 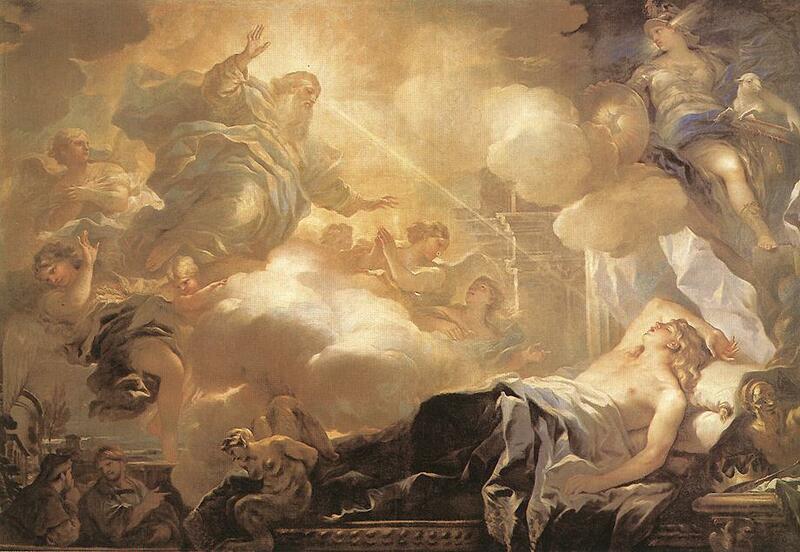 3 Solomon showed his love for the LORD by walking according to the instructions given him by his father David, except that he offered sacrifices and burned incense on the high places. 4 The king went to Gibeon to offer sacrifices, for that was the most important high place, and Solomon offered a thousand burnt offerings on that altar. 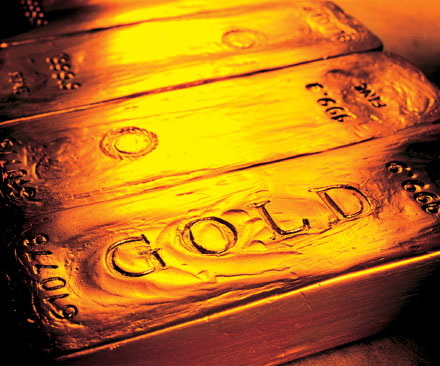 Such a huge number indicates Solomon’s wealth as well as his desire to honor the Lord. –with the exception of Christ! “The queen of Sheba will stand up against this generation on judgment day and condemn it, for she came from a distant land to hear the wisdom of Solomon. Now someone greater than Solomon is here—. 13 Moreover, I will give you what you have not asked for—both wealth and honor—so that in your lifetime you will have no equal among kings. 14 And if you walk in obedience to me and keep my decrees and commands as David your father did, I will give you a long life.” 15 Then Solomon awoke—and he realized it had been a dream. 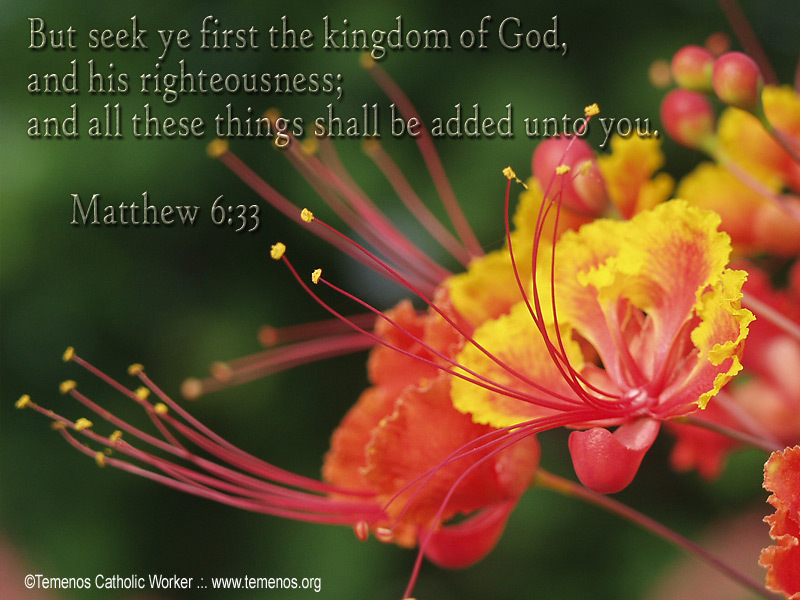 How blessed we are to have Jesus as our wise ruler on the throne! “Before the Throne of God Above” sung by the group Selah. He ever lives and pleads for me. Does it seem a little shady to you — that David technically keeps his vow not to kill Shemei, then orders his son to do it? Or that after years of loyal if not totally obedient service to David, Joab is put on the “To Kill” list? Clearly, David sees these matters, as well as the kindness to be shown to the sons of Barzillai, as important matters of justice. 11 He had reigned forty years over Israel—seven years in Hebron and thirty-three in Jerusalem. 12 So Solomon sat on the throne of his father David, and his rule was firmly established. The end of an era, the death of a hero, the story already a legend. Music from a stirring death today: The Epilogue of Les Miserables. Composed in 1980 by French composer Jean-Michel Schonberg, Les Mis is the longest-running musical in history, now in its 26th year in London. Based on a novel by Victor Hugo, the story follows Jean Valjean as he struggles for redemption. Colm Wilkinson sings Valjean. With David’s death, Abishag is now a “concubine widow.” But according to custom, the harem goes to the next king. Adonijah is using her to try to establish a claim on the throne. Which is to say, give the throne to all who had not supported David in his choice of Solomon as king. Another one out of the way . . . 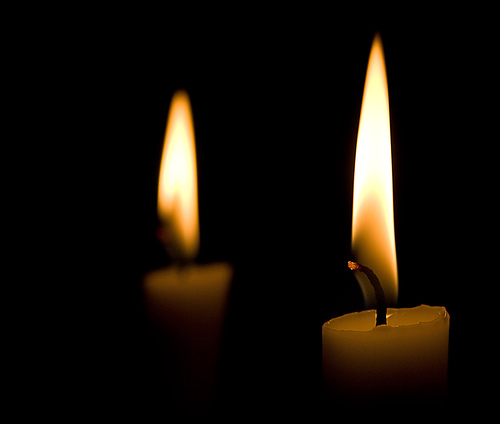 Claiming refuge at the altar meant protection to the innocent. 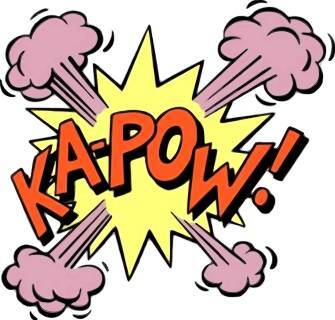 Joab was guilty of treacherously killing Abner and Amasa (not to mention Absalom). 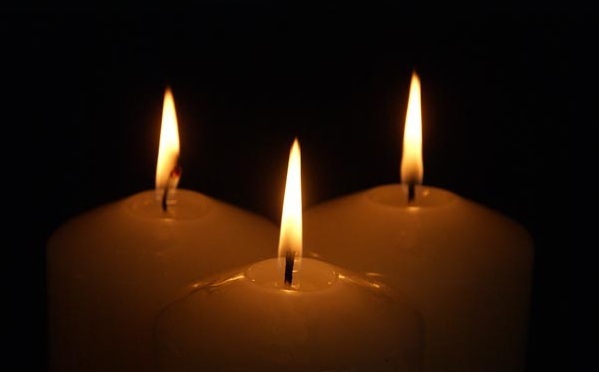 Solomon has the law on his side in this decision: But if a man acts with premeditation against his neighbor, to kill him by treachery, you shall take him from My altar, that he may die (Exodus 21:14). One more down . . .
And yet another one down . 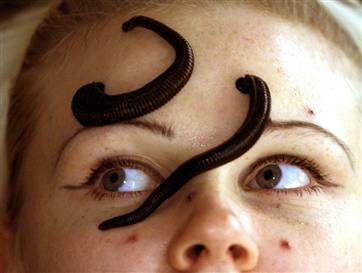 . .
As medical treatments go, not as bad as leeches . . .
She-of-the-unfortunate-name becomes, no doubt, David’s concubine and part of his household. 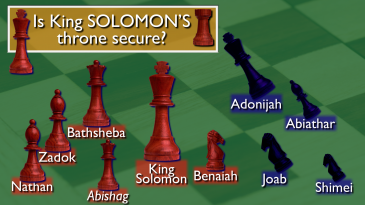 2 Samuel 3:2-5 describes the sons of David and lists Adonijah as the fourth son. We know that two of the three sons older than Adonijah are dead (Amnon and Absalom), and it seems that the other older son (Chileab) either also died or was unfit to rule because he is never mentioned after 2 Samuel 3:3. As the oldest living son of David, Adonijah would likely be considered the heir to the throne. A son too handsome for his own good . . . and again David’s failings as a father reap sad consequences. Why? 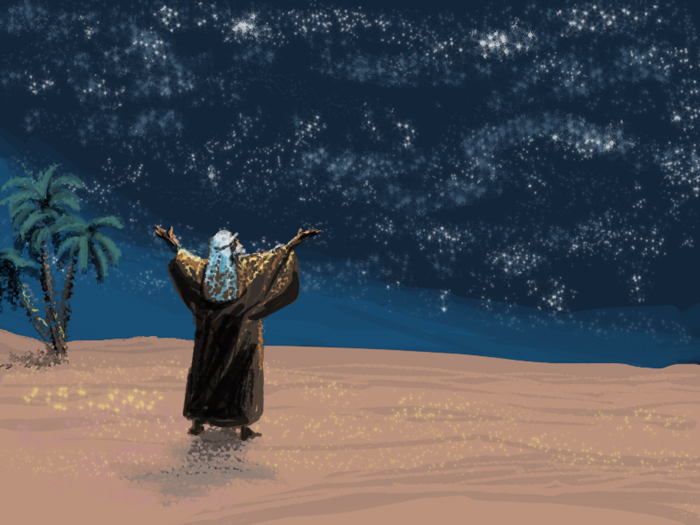 Joab (David’s chief general) and Abiathar (the high priest of Israel) both supported Adonijah, without any record of them asking the King David or, more importantly, asking the Lord. — and some very important people are not invited!
. . . because a new king often kills all his rivals. David will get a one-two punch . . .
As feeble as David is physically, he is strong in this situation, and takes definitive action immediately. 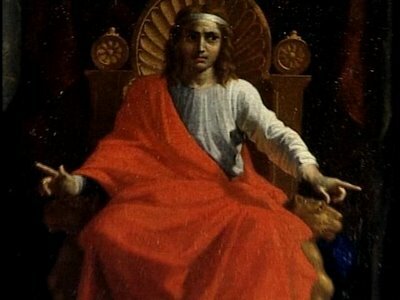 He will abdicate his throne and place Solomon upon it. 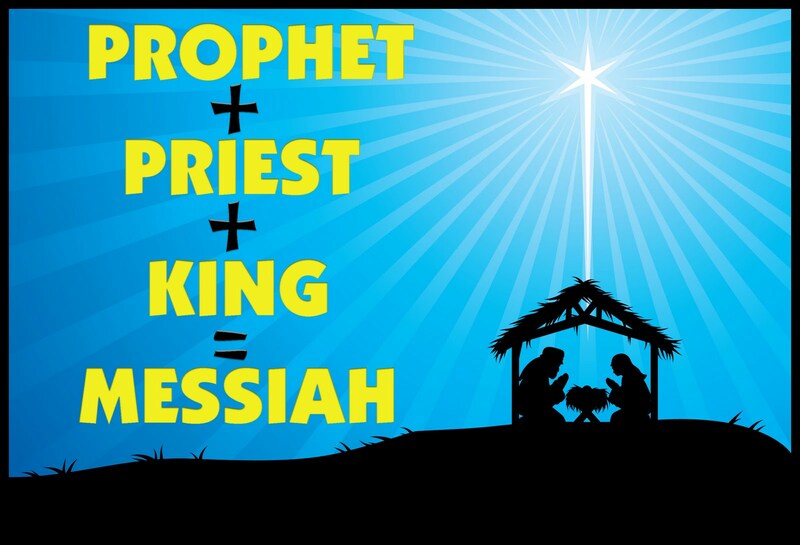 Prophet, priest, and king all working together. What a great idea! 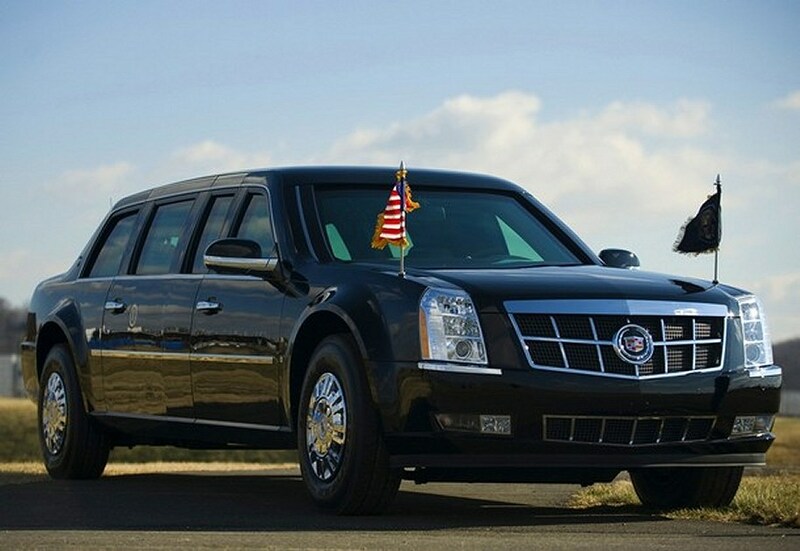 These were the days before armored Cadillacs for heads of state in parades! 49 At this, all Adonijah’s guests rose in alarm and dispersed. Oops — the party abruptly ends! The altar was a place of sanctuary and safety against vengeance. Virtually his first act: Solomon shows mercy. “Praise, My Soul, the King of Heaven” was written in England in 1834. It was played at the wedding of the future Queen Elizabeth in 1947. So this hymn has a doubly royal heritage! 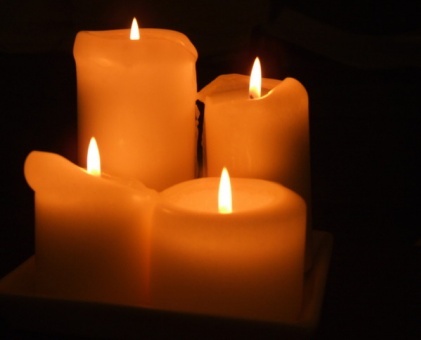 You are currently browsing the DWELLING in the Word blog archives for November, 2010.